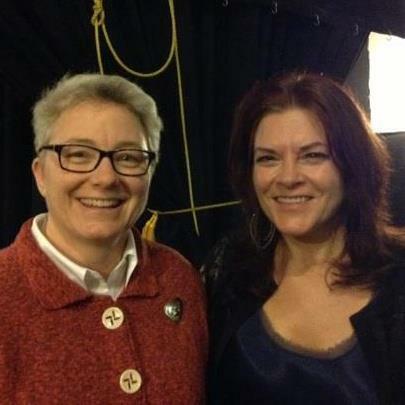 Last Friday, my spouse and I traveled to Vermont to see Rosanne Cash and John Leventhal in concert. This was not the first time I got to meet Rosanne. We became acquainted via Twitter about a year and a half ago. I followed her. We tweeted back and forth to one another a few times. She started following me. In November of 2011, I got tickets to see her perform in Fall River, MA and asked if she’d be so kind as to let me say hi to her after the show. Ever gracious, she did. The same happened last Friday. Kind and funny and smart and one of the greatest singer-songwriters of our time, she gave me a hug, joked about our mutual love of ironing (remembering this from our previous meeting), talked about librarians… it’s one of those moments I’ll cherish. And then, perhaps even more unreal, the next morning as Lynn and I were walking down Main Street, we heard from behind us, “Hello, ladies!” Turned around and there was Rosanne. We chatted for a minute on the sidewalk in Brattleboro, VT like some kind of old friends. Pinch me. Bright research star here on our campus, #Plankaday Nation co-founder, author of the #1 health blog of 2011 (FUdiet), and one of my biggest advocates for the new work I’m doing on campus, Sherry Pagoto and I hung out in her office on Tuesday to work on the details of a proposal that will allow me to work on her President’s Award grant. She took me on a few years ago as an exercise physiologist for one of her studies and today is a fantastic champion of me as an informationist. We have a Nobel Laureate on campus, a few Howard Hughes investigators, and some really outstanding leaders in biomedical and health sciences research. How I got lucky enough to have one of them in my corner… well, pretty lucky! 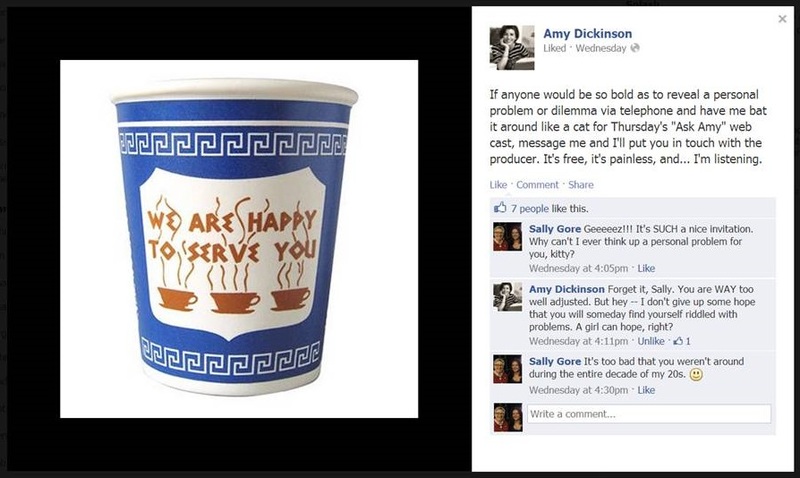 Facebook chatting with Amy, Wednesday, March 13. I had lunch yesterday with my uber talented and brilliant friend, Suzy Becker. Suzy is an author and a cartoonist and a teacher and one of those people you’d hate if she weren’t so darned nice. We talk over chicken shawarma sandwiches about girl’s high school basketball, her next book, her latest class at the Worcester Art Museum, her innate aptitude for Twitter, Lynn’s and my trip to Brattleboro, the PBS documentary “Makers,” why no women have sports talk shows, and the fact that she’s been on the Diane Rehm Show three times (3 times?!). She gives me a lucky horse shoe as a belated birthday present. I’m going to hang it in my new studio. She leaves to get her kid to the dentist on time and I walk home, still thinking about talking to Diane Rehm and helping someone with a Ford Foundation grant and knowing someone who’s putting together a new radio show and… lunch with me? As I think about my week and how it intersected in different ways with 4 unbelievably successful women, I notice how not a single one of them fits the mold of “success” that Sheryl Sandberg espouses in her book, “Lean In,” that coincidentally also had a big week. Sandberg has been all over the air waves, sharing her thoughts on why women have not achieved success equal to men, despite now years of “equality.” We need to lean in, be more aggressive, change our priorities. Maybe. If you want to be the CEO of a gazillion dollar enterprise. Me, I’m glad for the successful people that I know (or at least have had the chance to briefly meet) in my life. And incidentally, not a one of them fits Sandberg’s definition of success. Tip #1 in Daniel Coyle’s, “The Little Book of Talent” is “Stare at Who You Want to Become.” These are some of the people that I stare at. Despite their respective success – and a few of them are darned successful! – I’m not star struck. (Well, maybe a little.) No, just grateful to see and know and have people in my life to stare at, so that I can model the things that they do that bring them success. How about you? How was your week? Did you find inspiration from anyone? Do you look to certain people to be your models of success? Librarians are all about Sharing! Amen, Barbara! The fact that we define success under such narrow parameters is telling of a lot in our society. I was wondering what a successful librarian looked like? I’m a librarian myself in the health sciences. We are at a cross-roads in our profession. We are losing staff and with it morale. I would like to empower our health science librarians with a view of a successful future. I’d welcome your thoughts on this. New Year, New Month, New Project!